Pilot Daniel Hayden lands a Helio Courier on a braid bar along the Colville River. Dolores van der Kolk holds up a wind sock while Stephen Hasiotis snapps photographs. 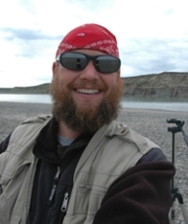 Daniel did an amazing job pulling our geology team out at the end of our 2012 North Slope-Alaska field season while floodwaters of the Colville were quickly rising.